An E-Commerce website is that website that sells feasible products online through a website. Now, opening a website is always one of the most tedious jobs one can do. An E-Commerce Website suits best if it is designed by the world’s most popular content management system WordPress. A WordPress E-Commerce website is capable of doing many functions and is also easy to use as well. You can easily manage your E-Commerce website with WordPress on your side. So now, allow me to give you some tips on how to start your E-Commerce Business on WordPress. But before that allow me to give you some of the reasons about why you should choose WordPress for your online E-Commerce business. See these reasons in the following section. Why Choose WordPress for E-Commerce Store? If you want a common platform where you can easily pull developers in on a project basis as you grow. As now you know why you need WordPress, so let’s get you going. Allow me to give a rundown how you can build an online store with the help of WordPress. Start your own WordPress eCommerce Website by Hiring WordPress Developers for Just $15/hr! Build Your Own Online Store With WordPress. Here in this section, I am providing you some brief steps that will help you understand the necessary steps you need to follow in order to build your own online store. For a website, the first thing that you need is a domain name and a web hosting service provider. There are many things that you need to consider before selecting a hosting service provider. A Domain name must be relevant to the nature of your online business. This is the first thing that will make you different from your competitors. Making the domain name generic is never recommended. There are many web hosting service providers that can offer you awesome hosting services. I recommend choosing a hosting service which provides you better services. Most of the web hosting service providers provide WordPress. You just need to go to the Cpanel of the service provider and install it in your hosting account. This will give you the power to manage everything on your website. Now, as you have installed WordPress in your hosting account. Now, you can access the WordPress dashboard directly from the Cpanel of your hosting account. Well, WooCommerce is the best part of WordPress when you consider building It consist loads of functions that will help you to make your online store function rich. You just need to visit the WordPress plugin inventory. Then you need to search for WooCommerce Plugin. Simply download it and then install. The Page Setup from the WooCommerce plugin is one of the most crucial steps. I have covered it separately later in the post. The next thing to come is Store Locale. This section is also important as you need to give all the details about where your store is located and which currency and measuring parameters you will prefer to use in your E-Commerce website. Looking for Custom WordPress Development Services for your WordPress E-Commerce Website?Click Here! I understand that taxes are the worst part when it comes to an online store website. However, you cannot skip the taxes, so you need to understand the tax system of your country and comply in accordance with that. Then the most crucial thing comes, which is the payment method. WooCommerce provides you two type of payments. One is PayPal and the other is Stripe. PayPal is always recommended as it is the most popular payment platform. However, I personally recommend both of the payment platforms. Now, after adding the taxes and the payment methods, you need to add your products. Well, of course without products there is no point of your online store. So, you must add the products. Just go to the WooCommerce option in the WordPress dashboard and select “Add Products”. Then fill out the product name, description, the central product data section which have the attributes such as pricing and taxes, stock level, cost of shipping, cross-sells, and product attributes. After this, you have to fill the product category, tags, Image and a gallery (If needed). Once you are done, you need to click the publish button at the bottom of the screen. “Shop” – this is the place your items will be shown. “Cart” – this is the shopping cart where your clients can go to change their request before continuing to checkout. “Checkout” – this is the place where the clients get a chance to pick the shipping/delivery technique and pay for whatever they’ve purchased. “My Account” – a sort of a profile page for enrolled clients (they will have the capacity to see their past requests there and oversee different points of interest). All you have to do at this phase of the WooCommerce wizard is tap the “Proceed with” button. WooCommerce will create these pages for you. 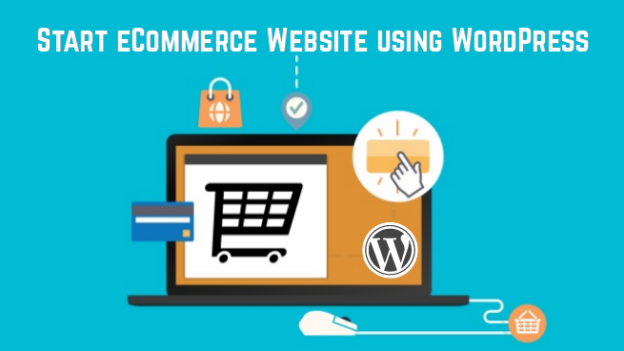 So, these are the steps that are needed to be followed in order to get a proper and easy functioning WordPress E-Commerce Online Store. I hope that quenches the knowledge buds of your mind. I always recommend consulting a custom WordPress development company before giving it a go. Use the chat option and let’s discuss the plans so that you can grow your business. Till then, Adios!! !